I recently acquired two models of the Otto Langen engine and I want to get them back running, but I have some questions. I saw them run about 6 years ago by the previous owner and he was running them on Acetylene. Since I would like to run them at shows and propane would seem much better to travel with and I could even get the camping bottles at local stores. Would it be possible for these engines to run on propane? and whether I run them on Acetylene or propane, should I be using a demand valve? ie http://www.model-engine-plans.com/engineplans/bookshelf/demandvalve.htm . Also, any advice on these as to running them? or things to watch out for? The larger one feels really smooth, but the smaller will need taken apart and some cleaning. Here are a couple of photos and will have more with much better quality get them checked and cleaned. You will need to run it on Acetylene. The Acetylene needs to be at low pressure, the easiest way to get Acetylene is to make it yourself using a small gas developer. You will need some Calcium Carbide (local Chemist or gardening shop), some water, a couple of jam jars, gas taps and some tubing. See diagram. Producing gas is very simple - you let some water drip on the calcium carbide. Use very little calcium, say a bottle cap full. the height of the water column determines the gas pressure. About 12 in of water should be about right. The gas will be very wet so you may wish to use a gauze drying agent. Did I mention: Acetylene is highly inflammable so treat it with respect. Thanks for the links Jo. In the video, they seem to be running the full size @ 2 inches of water. 12 in. would be about .5 psi. Does that sound about right? I realize that the small size of the model may have to be higher. I have small Acetylene tanks for a torch setup, but .5 psi is still pretty low. So Natural gas or lp gas runs about .5 psi to cook stove normally, so I guess that is what I am shooting for. I guess the big question is how sealed the engine is if it stops. I will have to check that. A friend of mine runs his hit miss models on propane and has a demand valve so that gas does not leak if it stops in the wrong position, so that was the question about that. I guess the main curiosity is if the diaphragms used for gasoline engines will be corroded by Acetylene. Or the other thought that there may not be enough vacuum in these engines to activate the demand valve. much to learn here. Rather than muck about with jam jars you would be better off with one of the small generators, sold by some camping/caving shops or the odd model engineering supplier such as TS, they also do small gas bags to give an even feed. I would think that a demand valve would work just as well for acetylene as propane if you sized the diaphragm correctly. As long as you have sufficient differential pressure to unseat the needle you should be good. I personally would use a Viton diaphragm to prevent deterioration. I realize I’m getting in a bit late on this, but I just joined this group. I run my Otto-Langen on acetylene; it will not run on propane (or map gas for that matter). I use one of the small “hobby” tanks (about a foot tall) from a torch set and get it filled for around $20 at the local gas supplier. I can run at many shows for many hours before I need to refill the tank. My engine runs on about a pound (pressure) of acetylene and I use a standard “torch” regulator. When I was at the Kinzers rough and tumble show an exhibitor had one of Wayne Grenning’s Otto-Langen models there and he was running it on acetylene using a demand regulator he had built from plans commercially available. I talked with Wayne Grenning and he told me his full size runs on ¼ lb. of gas (he was using the brew at Kinzer at that time which is part hydrogen and part methane). He double regulates his gas, using a first stage regulator (such as used with an acetylene torch) but then uses a secondary regulator to get the pressure down to ¼ lb. In my mind, to a large degree, the pressure required is a function of the size of the gas ports in your valve. My model uses two ports that are .030 inch in diameter. Wayne Grenning suggested I go to one gas port that matches (in size) my four air ports which are .078 inch diameter and then add a second regulator to reduce the operating pressure to ¼ lb. I was planning on following Wayne’s suggestion but my model is currently running so well now that changing seems superfluous. I'm pretty sure ( awaiting confirmation ) that the Anson Engine museum run their full sized Otto Crossley atmospheric engines on Propane but use Hydrogen just for the flame carrier ignition system. I'm well aware that " scale " plays a massive part and that Propane is a gas that has a particularly narrow band of " perfect " combustion. These models use HT spark ignition I presume? In my mind I can't see why a correct mixture of fuel and air wouldn't work. I'm reminded of my youngest son shooting tennis balls across our garden using a plastic drain pipe that had a baked bean tin taped to the end. A hand torch and a Piezoelectric igniter attached to a spark plug were fitted into the bean tin. Once he got the mixture " dialled in " trajectory set, he could easily achieve 60 feet plus. If however, a glow plug is being used then I have absolutely no idea, as I have never used them. All I can say is that it's the atmospheric pressure that's providing the power not the combustion event. That last sentence is for our readers that may be unfamiliar with the workings of the most early internal combustion engines that followed the principles of Christiaan Huygens. In theory I would have to agree, in principal I found things to be different. I am familiar with the device mentioned above; in my case in the form of a potato gun. You load a potato down the barrel; spray a bit of propellant in the breech, and then use a sparking device to fire the potato out the barrel. When I first built the column of my engine I thought I might simulate this device (to see if I could attain combustion within the column) by injecting a bit of propane into the column, placing a tennis ball over the mouth of the column, and then causing the spark plug to fire. I was amazed when the fuel/air mixture in the column would rarely fire, even as widely I varied the amount of propane injected into the column. Back then I never thought of using acetylene, but I’m willing to bet I would have had much better results. My otto-langen uses spark ignition. Still, I found it difficult to get even intermittent ignition with my engine using propane, let alone continuous operation. Acetylene combustion occurs under two chemical formulas one producing carbon dioxide and the other carbon monoxide. This provides a larger air/fuel band where combustion can occur. Since, with my engine, the acetylene is under pressure, I theorize that as the engine speeds up and slows down the slide valve cycles at different rates (is open for different periods of time) thus different amounts of fuel is emitted into the combustion chamber. Also, with the changes in speed, the piston is raised more or less aggressively, thus changing the amount to air available to combustion. With my engine I found it nearly impossible to control these ratios and thus accurately control the resulting mix of fuel and air. With the combustion parameters varying as I describe above, it took much trial and error to discover the size and number of gaseous fuel jets drilled into the slide valve to result in a consistent combustible mixture of fuel/air. I never found a size of gaseous fuel jet that allowed the engine to run on propane; I was successful when acetylene was used. Having said all this, I have a friend who has a small otto-langen (stands around 10 inches tall) that successfully runs on propane. The setting of the propane valve is extremely critical. His engine cycles very fast. It fires nearly every second. Possibly this is why it runs on propane? Ah, a " Spud " gun, spuds being a British slang for potatoes. I felt tennis balls were a lot safer for a youngster to be playing with. I'm in total agreement with your comments, theory and practice don't always share the same results. It's very likely that the mixture, particularly at smaller scale varies considerably. May I suggest an experiment? You could try to " pipe " the mixture from a small Propane torch directly into the intake manifold. The burners are designed to provide a perfect mix. I used this technique to make my gas rings for hot tube ignition with great success. I would like to compliment you on your build of the Otto Langen, I know, full well the problems of getting a good finish in the cylinder. A couple of friends built a full scale replica of a European licenced Otto, it was the boring and honing of the cylinder casting that gave them the most trouble. Yes, I will agree that boring and honing the cylinder so that it is straight, it is uniform in diameter for the length of the column, and it possesses as smooth a surface as possible cannot be over emphasized. Though I feel I did a “reasonable” job on my engine, it is not perfect on my model in that I have some leakage; fortunately not enough to drastically affect its operation. This past Summer when I attended the Kinzers 150th year celebration of the Otto-Langen engine with their own 1869 original (near Lancaster, PA. USA), Wayne Grenning also attended with his full size Otto-Langen replica he had just completed. I had an excellent opportunity to observe it in operation. What a magnificent piece of machinery. His engine utilizes a governor to regulate the speed of the engine and it does this by holding the exhaust valve closed until the flywheel speed drops low enough that another power cycle is warranted. The engine fires, the piston is driven down onto the spent exhaust gasses by atmospheric pressure, and it then it just remains there, resting on the gasses left over from that combustion. The fit of piston/rings to cylinder and slide valve parts must be phenomenal in that no appreciable leakage can be observed. Then engine remains in this state of rest for over half a minute as the flywheel slowly spins down until the governor finally opens the exhaust, allowing the piston to settle to the bottom of the cylinder so that another power cycle can occur. When this occurs, one can hear the hiss of escaping gasses and then observe the piston settling to the bottom of the cylinder. You have to see this to appreciate the workmanship he put into the engine. So in summary I completely agree with you; the boring and honing of the cylinder is immensely critical to achieve an engine that will run well. While we’re discussing critical areas with the Otto-Langen I would not overlook the role the sprag clutch plays in the successful operation of this engine. The clutch must rotate freely in one direction, offering minimal drag to the mechanism during the coasting and firing cycle, but then must instantly and firmly engage without slippage in the reverse direction so that all the atmospheric energy is transmitted to the main shaft and flywheel. Equally important, the clutch must dis-engage as smoothly as it engages. When I designed the clutch on my model, I modeled this slip/engage/dis-engage activity with a trial device I devised and built, so that it would assist my design of the clutch and when I built the actual clutch it would function properly. Even with this trial device and the modeling it provided, I still found a little “tweaking” of the final design was required. When I look at my Otto-Langen model, in my assessment the most successfully designed and executed part of the model is this clutch. I also would not overlook the role the ratchet and pawl play in this engine. These parts require hardening and I went through several design and fabrication cycles before I got a mechanism that would positively latch in and latch out smoothly without chattering. Craig how did you go about boring and honing the cylinder, mine is roughed out 4mm undersize and will be a gob I need to tackle soon. I'm thinking of mounting on the lathe cross slide and using a between ctrs boring bar. Tha Anson put on an exhibition of Otto Langen Crossley patent engines a couple of years ago. They called it the " Rattling Monsters exhibition " as they're not very quiet whilst in operation. They had the largest engine that survived, a 3 HP running beautifully, along with some others, the noise was deafening! I'm glad you mentioned the " sprag clutch " a very important and complex component. Did you ever think about using a proprietary " sprag clutch bearing " ? They're relatively cheap and could be nicely hidden within the casing. I'm just thinking out loud here, it would have saved many hours of painstaking work. With regards to Jason's question, what's the bore diameter and length? When I started to build a roughly one third scale Brayton readymotor I used an automotive cylinder boring machine to do the job. Most are familiar with the name Van Norman mine was a Buma. I had a 1"/25mm thick Steel plate Lumbsden ground and cut rectangular. I bored a hole through one end to allow the boring head to pass and sat the machine on the other end. A couple of large diameter studbars were used to clamp the already faced cylinder to the underside. 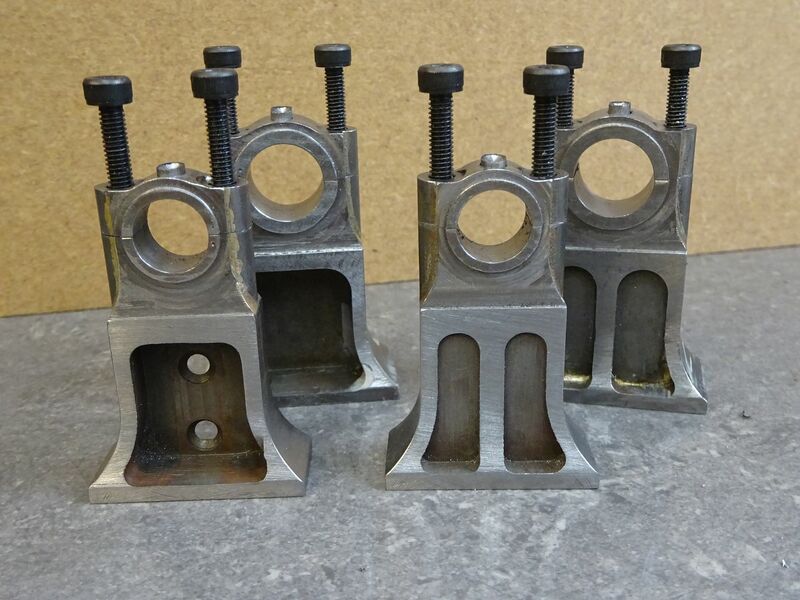 The whole assembly was then firmly clamped onto one of my milling machine tables.
" Flexihone " to get a shine on the Iron. Sadly the foundry shut down before I could complete the project, the cylinder, piston and cylinder covers lie sitting on a shelf. Mine will be about 12.75" x 1.625", I can just do it with a between ctrs bar if I let the actual live center enter the bore. Been doing the bearing pedestals recently, the one with the two holes will support the governor bracket though I will make it a dummy governor. I'm thinking of using one of these types of sprag clutches rather than the pressed cage where the rollers grip directly on the shaft. Should ensure that all the clearances are correct and I just need to fit it into the clutch housing and onto the shaft.